What is a cam gear? What is an indexer? HEINZ cam gears transform a uniform rotational movement into an intermittent output movement. Say, the constant rotation of the input shaft is converted into a clocking stepping motion. This finds an application in automatic assembly machines, for example, to clock and precisely position a product through several assembly steps. This is also the reason why these cam gears are often called step gears / indexers. High step frequency, possible are up to 2000 cycles per min. Gentle starting and braking due to positively controlled movement through the cam. Positive positioning, no additional positioning unit required. Constant movement time, the overlapping of movement processes is possible without loss of time. Very high reliability; runs for several years without interference. HEINZ cam gears work in both directions of rotation and can also be used reversing. Due to the backlash-free design of the HEINZ cam gears a very high accuracy will be achieved. 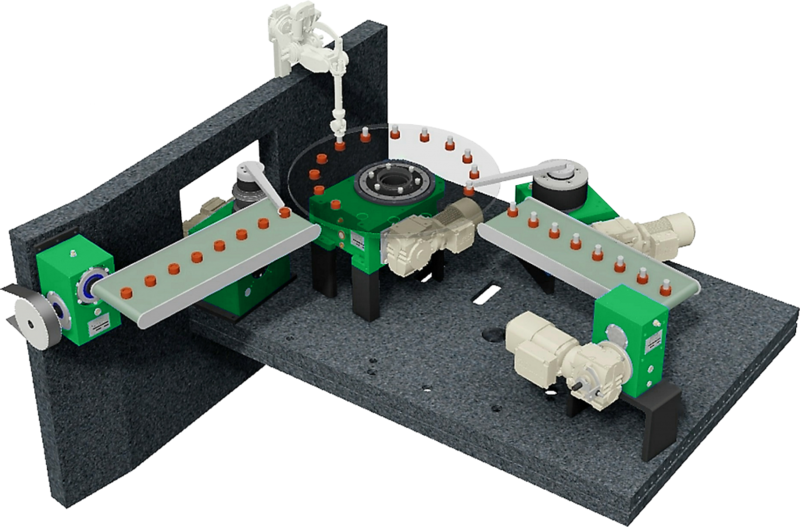 The use of a HEINZ cam gear is particularly important in applications with a high demand for exact and identical repetitive step movements such as, for example, in packaging machines, automatic assembly machines, press automation and handling equipment. In the following video you can see our exhibition products, which give a rough impression of the possible applications.